Give the grill master in your life a heavy-duty sports or military spatula that bears a laser-etched logo. 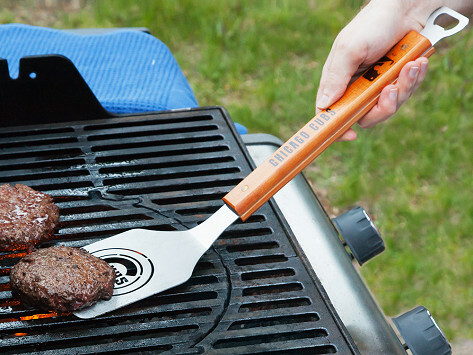 Made from stainless steel and hard maple wood, the spatula is generously sized with a built-in bottle opener that makes it cookout- and tailgate-ready. Choose from any of the major-league teams, over 140 college teams, or pick a favorite branch of the military. Dimensions: 18.5" x 4" x 2"
Great way to show you're a fan! I have bough several of the Grill Spatula's. Seem to be excited about cooking with them. Very nice quality and sturdy. I thought the item was unique. It was a gift so I don't know what the receiver thought of the actual item. Sportula's heavy-duty sports team tools, BBQ sets, and oven mitts work hard while they show off team spirit. The oversized Sportula spatula is made from stainless steel and hard maple wood with a built-in bottle opener to boot. It can flip burgers and steaks, then crack open a cold drink. To grab hot dogs and more, opt for the three-piece set. 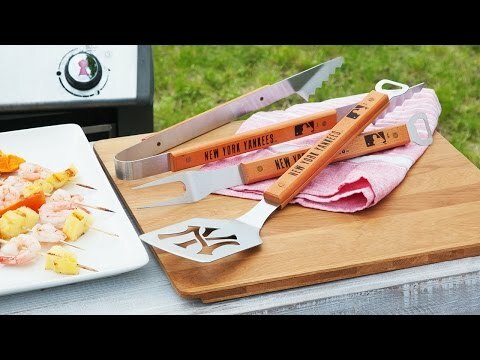 It’s built just as beautifully and includes tongs and a grill fork (which also has an integrated bottle opener). Choose any NHL, NBA, MLB, and NFL team—and from over 140 college teams. If your loyalty is to the military, every branch of the service is represented, too. All of the logos are laser-etched for a bold look. To protect hands and help pump up the crowd, the foam finger-inspired oven mitts will get a cheer from any number one fan. With Sportula's full array of sports fan goods, gearing up for the big game is a no-brainer. The only question is, who's your team?